In this updated and greatly enlarged edition of her Book of Middle Eastern Food, Claudia Roden re-creates a classic. 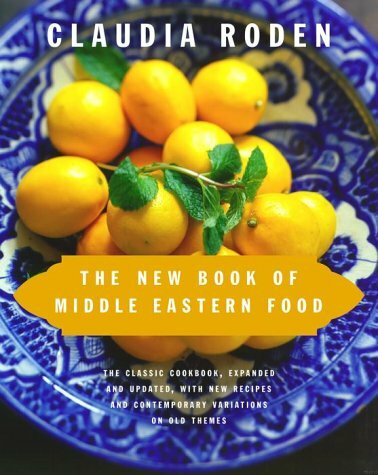 The book was originally published here in 1972 and was hailed by James Beard as “a landmark in the field of cookery”; this new version represents the accumulation of the author’s thirty years of further extensive travel throughout the ever-changing landscape of the Middle East, gathering recipes and stories. Now Ms. Roden gives us more than 800 recipes, including the aromatic variations that accent a dish and define the country of origin: fried garlic and cumin and coriander from Egypt, cinnamon and allspice from Turkey, sumac and tamarind from Syria and Lebanon, pomegranate syrup from Iran, preserved lemon and harissa from North Africa. She has worked out simpler approaches to traditional dishes, using healthier ingredients and time-saving methods without ever sacrificing any of the extraordinary flavor, freshness, and texture that distinguish the cooking of this part of the world. From the tantalizing mezze--those succulent bites of filled fillo crescents and cigars, chopped salads, and stuffed morsels, as well as tahina, chickpeas, and eggplant in their many guises--to the skewered meats and savory stews and hearty grain and vegetable dishes, here is a rich array of the cooking that Americans embrace today. No longer considered exotic--all the essential ingredients are now available in supermarkets, and the more rare can be obtained through mail order sources (readily available on the Internet)--the foods of the Middle East are a boon to the home cook looking for healthy, inexpensive, flavorful, and wonderfully satisfying dishes, both for everyday eating and for special occasions.